Put the preconceived notions to bed, because Chevrolet has a quality small car in the form of the 2014 Cruze. For 2014, the Cruze Diesel model, powered by a 2.0-liter turbocharged diesel four-cylinder, is added at the top of the Cruze lineup. Handsome interior design; two satisfying high-efficiency engine choices; useful electronics interface; secure handling; big trunk. The impact of the Chevy Cruze can't be underestimated. Introduced in 2011, this small economy sedan has made Chevrolet a brand to consider once more in the compact-car market, as the overall refinement, efficiency and packaging of the Cruze make it a serious rival for the Japanese-brand cars that have dominated the segment for a generation. Points in the 2014 Chevrolet Cruze's favor include a lineup of solid-performing, high-efficiency four-cylinder engines, a sophisticated ride and handling balance, and the car's sharp, non-gimmicky design inside and out. Passenger quarters are a smidge tight for this class, but most consumers will find them adequate. The Cruze also offers an unusually large trunk for a compact sedan. Chevy has added some spice to the Cruze line for 2014 with the introduction of the Cruze Diesel. Equipped with a 2.0-liter turbodiesel four-cylinder engine and rated at 33 mpg combined by the EPA, this model directly targets the only other diesel-powered compact sedan in the U.S.: the Volkswagen Jetta TDI. Though closely matched in terms of overall performance and fuel economy, the diesel Jetta does have a larger backseat and starts out a little less expensive than the Chevy. In fairness, however, the Cruze diesel comes with a few more standard features, such as remote starting and leather seating, making their base prices essentially the same. Of course, there are a bunch of worthwhile compact cars in this price range, and it's now hard to pick a loser in this ultracompetitive segment. If top-of-the-world fuel economy isn't your priority, the 2014 Honda Civic is a can't-lose proposition, thanks to a spacious, high-quality interior and likable road manners. The 2014 Hyundai Elantra and its cousin the Kia Forte provide solid performance and plenty of standard and available upscale features. You might also consider the Ford Focus, which looks and feels more sophisticated than most of its rivals, or the similarly refined 2014 Mazda 3, which offers the sportiest handling in this class. Although the 2014 Chevrolet Cruze doesn't dominate in this group, it's on equal footing with most of its competitors and certainly worth a look if you're shopping for a well-rounded compact sedan. The 2014 Chevrolet Cruze is a small sedan offered in five trim levels: LS, LT, LTZ, Eco and Diesel. The LS includes 16-inch steel wheels, OnStar, keyless entry, a tilt-and-telescoping steering wheel with audio controls, air-conditioning, a six-way (manual) adjustable driver seat, a 60/40-split-folding rear seat, a trip computer, full power accessories, Bluetooth phone connectivity and a six-speaker sound system with a CD/MP3 player, satellite radio, USB port and an auxiliary audio jack. The LT is made up of the 1LT and 2LT equipment-level subsets. Compared with the LS, the 1LT upgrades to the 1.4-liter turbocharged gasoline engine, 16-inch alloy wheels, cruise control and a leather-wrapped steering wheel. The same features in the Eco's Driver Convenience package are also available for the 1LT. The 2LT has all of the 1LT's standard equipment, plus the power driver seat and MyLink touchscreen interface. It also comes standard with 17-inch alloy wheels, a sport-tuned suspension, four-wheel disc brakes, leather upholstery and heated front seats. The Cruze LTZ comes with all of the 2LT's content, as well as all of the items in the Technology and Driver Convenience packages. It also features 18-inch alloy wheels, foglights, keyless ignition/entry, automatic climate control and premium interior trim. The Eco Cruze is equipped like the 1LT, but has the MyLink interface as standard. It also benefits from aerodynamic improvements (including a rear spoiler), lightweight 17-inch alloy wheels, low-rolling-resistance tires and a smaller fuel tank (manual-transmission version only). The Cruze Diesel comes with all of the 2LT model's standard equipment, plus the Eco model's aerodynamic enhancements and low-rolling-resistance tires. It has lightweight 17-inch wheels, too, but they're a different design. The Enhanced Safety package is available for all but the LS model and includes rear park assist, blind-spot monitoring and rear cross-traffic alert. A hard-drive-based navigation system, a Pioneer nine-speaker premium sound system and a sunroof are also available on most trim levels. The RS appearance package is available on the LT and LTZ models and features restyled front and rear fascias, rocker moldings, a rear spoiler and, on LT models, foglights and an upgraded instrument panel. All 2014 Chevrolet Cruzes are front-wheel drive. The Cruze LS is powered by a 1.8-liter four-cylinder engine that makes 138 horsepower and 125 pound-feet of torque. The LT, LTZ and Eco are fitted with a turbocharged 1.4-liter four-cylinder that generates 138 hp and 148 lb-ft of torque. The Cruze diesel has a turbocharged 2.0-liter diesel four-cylinder rated at 151 hp and 264 lb-ft of torque. A six-speed manual transmission is standard on the LS, LT and Eco. A six-speed automatic is optional on those trims and standard for the LTZ and diesel. In Edmunds testing, a Cruze with the turbo 1.4-liter engine and an automatic transmission accelerated from zero to 60 in 9.2 seconds, a slightly slower than average time for this class. The Cruze diesel ran the sprint in 8.6 seconds, the same as the VW Jetta TDI automatic. The Cruze diesel also does very well regarding fuel economy, too, with EPA estimates of 33 mpg combined (27 city/46 highway). Those are good numbers, though the Jetta TDI maintains a slight edge with its 34 mpg combined EPA rating. 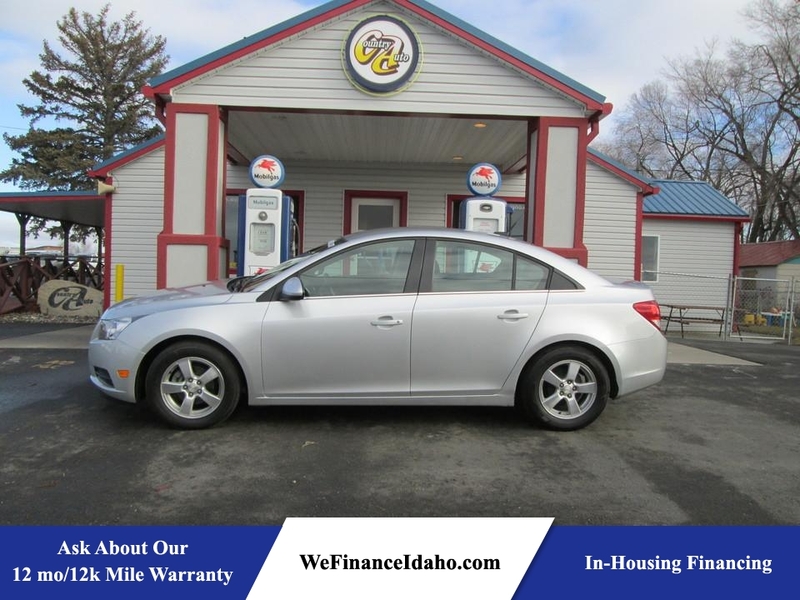 In addition, the Cruze Eco is just about as frugal, with a laudable 33 combined (28 mpg city/42 mpg highway) rating with the manual transmission and 31 mpg combined (26 mpg city/39 mpg highway) with the automatic. Fuel economy stands at 29 mpg combined (25 mpg city/36 mpg highway) for the Cruze LS with the manual transmission and 27 mpg combined (22 mpg city/35 mpg highway) with the automatic. The turbocharged engine (LT and LTZ) with either transmission receives a 30 mpg combined estimate (26 mpg city/38 mpg highway). All 2014 Chevrolet Cruze models come with stability control, antilock brakes, full-length side curtain airbags, front knee airbags and front and rear side-impact airbags as standard. A front-disc/rear-drum brake setup is standard on all models except the 2LT, LTZ and Diesel, which are upgraded to four-wheel disc brakes. Also standard is OnStar, which includes automatic crash notification, on-demand roadside assistance, remote door unlocking and stolen-vehicle assistance. A rearview camera, blind-spot monitoring and a rear cross-traffic alert system are optional for all Cruzes except the LS. In government crash testing, the Cruze earned a top five-star rating for overall safety performance, with five stars in the frontal- and side-impact categories. In Insurance Institute for Highway Safety testing, the Cruze received a top score of "Good" in moderate-overlap frontal-offset, side-impact and roof-strength testing. In the small-overlap frontal offset test, however, the Cruze scored a second-lowest "Marginal" rating. The Cruze's seat/head restraint design was rated "Good" for whiplash protection in rear impacts. In Edmunds brake testing, a Cruze LTZ stopped from 60 mph in 120 feet, a slightly better-than-average distance for this class of car. Even with their less grippy, fuel-economy-friendly tires, the Cruze diesel and Eco models stopped in about the same distance. The interiors of compact cars often show obvious signs of cost-cutting, but the Cruze's cabin has a classy two-tone color scheme and looks more upscale than many of its competitors. That said, there are still a lot of hard plastic surfaces, and they're particularly noticeable in the pricey Cruze diesel. Given the long-distance driving-range potential of the diesel, more padding on the armrests would be welcome. On the upside, the MyLink touchscreen interface is one of the simplest and most straightforward infotainment systems out there, and its voice-control interface is highly functional. Some drivers might find the Cruze's front seats a bit narrow, but they're supportive and comfortable, and they offer plenty of adjustment. A low bottom cushion for the backseat diminishes comfort for longer-limbed riders, as it doesn't give enough thigh support. The Cruze's rear seat legroom is only average for the segment; you'll find more space in the Civic and Jetta. Considerably above average, however, is the Cruze's large trunk, which measures an impressive 15.0 cubic feet on all but the diesel, whose capacity is a still ample 13.3 cubic feet. The 2014 Chevrolet Cruze deftly combines responsive handling with a comfortable, compliant ride. The sport suspension on the 2LT, LTZ and Diesel models is firmer but still provides an agreeable ride. The turbocharged 1.4-liter gas engine is pretty average in terms of outright acceleration, but it's peppier around town than the 1.8-liter thanks to its increased torque. The main issue, however, is the automatic transmission. Programmed for maximum fuel economy, it's reluctant to downshift for quick acceleration and passing unless you really boot the gas pedal. The more potent Cruze diesel model is an intriguing choice and a win-win proposition, as it offers both good fuel economy and satisfyingly brisk acceleration by compact-sedan standards. As with most turbocharged engines, there's a brief pause when you hit the throttle from a standstill, but then the sedan gathers speed quickly. The Cruze diesel uses a different six-speed automatic transmission from other Cruzes, and we've found it more responsive in highway passing situations. And forget about the stereotypical diesel clatter -- thanks to extra sound insulation in the diesel model, you'll rarely hear the engine at all.